My applied category theory course based on Fong and Spivak’s book Seven Sketches is going well. Over 300 people have registered for the course, which allows them to ask question and discuss things. But even if you don’t register you can read my “lectures”. Here are all links to the lectures on Chapter 1, which is about adjoint functors between posets, and how they interact with meets and joins. We study the applications to logic—both classical logic based on subsets, and a nonstandard version of logic based on partitions. And we show how this math can be used to understand “generative effects”: situations where the whole is more than the sum of its parts. But the real payoff comes in Chapter 2, where we discuss “resource theories”. Hi John. It’s great that you’re doing this course, and that registration figure is impressive! However… there is something near the very start of your course that I really strenuously disagree with. You’ve already heard some version of what I’m about to say, because I said it to everyone at the Applied Category Theory meeting we both attended in Leiden. But at the time I didn’t realize we differed on this. “Applied category theory” is fairly new. also mainly means applications outside computer science. You might mean it that way, but I don’t, and I think the usage you’re encouraging is an awful mistake. It also seems unnecessarily rude to those who apply category theory to computer science. That’s a set of applications at least as deserving of the term as any other. And as you mention, applications of category theory to computer science have been important for decades. That stuff is applied category theory in any reasonable sense of the phrase, and it’s not new. And honestly, if that was my research area — which it’s not — then I’d be pretty pissed off to hear someone influential saying that applied category theory was new, or that the applications of category theory I work on don’t count. Let’s step back and think about the more general term “applied mathematics”. For historical reasons, most mathematicians’ default interpretation of “applied mathematics” is much narrower than it could be. It’s usually understood to mean something like “methods of analysis applied to physical problems”. Someone who studies the Navier–Stokes equations will typically be called an applied mathematician, even if they’ve never touched a fluid in their research life. But someone who applies number theory to cryptographic systems, or knot theory to problems of genetic recombination, or category theory to the design of programming languages, will usually not be. Whether someone is called an “applied mathematician”, or is said to do “applied mathematics”, has little to do with their proximity to any actual application. It’s just a product of how language and culture have evolved. I hope mathematicians and other scientists hurry up and realize that there’s a glittering array of applications of mathematics in which non-traditional areas of mathematics are applied to non-traditional problems. It does no one any favours to keep using the term “applied mathematics” in its current overly narrow sense. People coming up with exciting and unconventional applications of mathematics (including exactly the kinds of things you’re lecturing about) fully deserve the credit for doing applied mathematics. We should fight for the term “applied mathematics” to be used in the broadest and most inclusive way possible. For much the same reasons, I’m dismayed (and actually a bit shocked) to see you declaring that applied category theory “mainly means applications outside computer science”. Why exclude them? It doesn’t make sense as a use of language, it’s potentially insulting, and it gives a false impression. After all, when we’re talking about applications of category theory outside mathematics, applications to computer science are the most conspicuous success story of all. “Californians” mainly means people from California who aren’t called John. We get to decide how to use language. You’re giving a course to hundreds of people; you’ll have an influence on how the term “applied category theory” comes to be used. Why would you want to exclude applications to one particular field? Obviously you can exclude applications to computer science from your lectures — that’s not the issue — but why would you want to exclude them from the term “applied category theory” itself? I didn’t understand what you were getting at, back then. Now I think I do, because you’ve explained it more clearly. I’ll change my usage of “applied category theory”, or maybe stop using that term. As you know, I crank out lots of prose. That means I often don’t think very carefully about the ramifications of what I’m saying. I’m pretty careful to qualify statements about mathematical or scientific facts, to indicate how certain I am and why, etc. Mathematicians are trained to do that! But I’m not always careful to calibrate the social consequences of what I say. Often if something sounds good at the time I’ll just say it, without any very good reason. Sometimes I have to clean up messes later, like now. For much the same reasons, I’m dismayed (and actually a bit shocked) to see you declaring that applied category theory “mainly means applications outside computer science”. Why exclude them? When I wrote those words in Lecture 2, it was because a lot of people registering for the course said they were Haskell programmers wanting to understand monads and such. I was afraid they’d be disappointed, because the course is not about that at all. That was the main reason for saying this. I’ll try to rewrite the lecture so it talks more about this course and less about some general concept of “applied category theory”, which is not anything I really want to define. There are a few other issues, which I’ll mention in other comments. I now agree it’s dumb to use the term this way. But anyway, one of my main quests these days is to extend the applications of category theory to new subjects. And I often find myself wanting some term for this quest, preferably something less scary than “completing the takeover”. Maybe there shouldn’t be any term for it. A name would be helpful for rallying people, but you could argue that any “rallying” tends to create an “in crowd” that excludes others as the “out crowd”. I don’t know. I have one particular line of work that I call “network theory”, which applies category theory to study networks. This is specific enough and clear enough to be fairly unproblematic, I hope. Admittedly other people study networks in very different ways, and talk about “network theory” in a way that talks about graphs a lot but doesn’t mention categories. But I think this is okay: ultimately the study of networks will use whatever tools are helpful, and I’m just doing the usual thing of working within some field, advocating the use of certain tools, and seeing if anyone is interested. and now we’re planning a repeat, which so far has the obvious name “Applied Category Theory 2019”. And of course, a bunch of people dislike that title too! My personal solution may be to steer clear of this naming business in the future. But workshops and conferences and journals need names, so while I can dodge it, the problem won’t go away. Luckily, some people enjoy making up names for things and arguing about them. When I talk about that field (in which I partially work as well) to other mathematicians, I usually refer to it as “categorical network theory”, or sometimes as “categorical complexity (theory)”. I find it the most descriptive, at least to other mathematicians. Of course, that has the problem mentioned elsewhere of not specifying whether you mean “applied outside math” versus “applied inside math”, but so does “applied category theory”. I fear that, unfortunately, the name “Applied Category Theory” is spreading among a small crowd. I’m looking at the article by Tai-Daene Bradley where it’s right in the title What is Applied Category Theory? and is sprinkled all over the place (as in the phrase “Applied Category Theorist”). 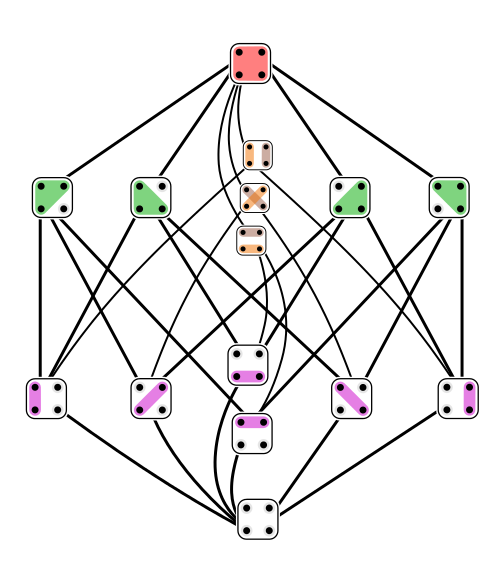 The category theory represented in this so-called Applied Category Theory is a tiny sliver of the subject, far too small to justify planting a flag and declaring that Applied Category Theory is this. I’m sorry, but I find it both obnoxious and embarrassing, a terrible idea for all the reasons Tom laid out. Could I ask you and your (mostly young) colleagues to please stop spreading the term, because it seems so off-putting? I hope you can find a more accurate and honest description, one hewing closer to the general features of the subject. Paolo Perrone’s suggestion of “categorical network theory” sounds like a step in the right direction. “Compositionality” is also at least sort of in the right spirit, even if it’s a mouthful. I’m trying to think of suggestions of my own, but I’m struggling too. The applications to things like Petri nets and chemical reactions and compact closed approximations to quantum mechanics make me think of the word “processes”, so that maybe something like “categorical process theory” might not be too delimiting. I think the word “process” is at least open and available for use, so you would get to put your own stamp on it. The idea that processes compose both in parallel and in series, and admit feedback, as general features of what we might mean by the term, seems intuitive to me. Also I think the word “process”, despite being abstract and general, would conjure up physical associations for most people, underscoring the desired emphasis on applications. Maybe we could talk to Bradley directly and ask him to change his note, since it seems likely to be widely read? In some places he seems to acknowledge the point that what’s being discussed is a particular family of new applications, e.g. And her first name is Tai-Danae. Rereading my original comment from June, I’m a bit embarrassed. While I haven’t changed my mind on the issue, I needn’t have hammered the point home nearly as hard as I did. Certainly I wasn’t as angry as the comment makes me sound (a general law of the internet that should surely have a name). And so I especially appreciate John’s gracious, calm response. I had a quick browse of Tai-Danae’s booklet and very much liked the look of it (modulo, of course, the question of whether “applied category theory” is being used in an overly non-inclusive way). Although I do think that names can be very important, I hope the conversation about naming won’t squash anyone’s enthusiasm for the mathematics they’re doing and communicating in creative ways. Yeah, I don’t mean to cast any aspersions on the mathematical content of the book either. In general the field seems totally worthwhile and ripe and deserves a wide audience. But FWIW I was glad you said what you did, Tom. I think it’s an important point. We all know how category theorists are looked at askance by many people for (alleged) overhyping, and this is the type of danger I see in the choice of words here, and largely what I see as so dismaying – that and the fact that the term shows no sign of going away, unless someone says something. As usual with names for such observations, it means only that someone happens to have remembered hearing you say it. Tai-Danae Bradley, Notes on applied category theory, September 18, 2018. Concrete suggestions for improvements will probably work better than telling her the title is “obnoxious and embarrassing, a terrible idea” and “a serious problem”. True! On the other hand, whatever replacement name is adopted would have to get buy-in from a substantial number of the people working in the field, which doesn’t (yet) include those of us doing the complaining here. Personally, I like Todd’s suggestion of “categorical process theory”. But more important is what do you (John) think? And Tai-Danae, and everyone else who’s actually working on this stuff? Would you say that that name captures what you’re doing? I think this is too specific, which is one of several reasons I won’t go on the warpath to replace “applied category theory”. Tai-Danae Bradley’s book, based largely on the school for Applied Category Theory 2018, focused on two example applications of functorial semantics: chemical reaction networks using decorated cospan categories, and linguistics using Lambek’s pregroup grammars. The first deserves to be called “categorical process theory”. Does the second? I’m not sure. We’ll also have a week-long conference where people submit papers on many topics. In short, we want the “applied category theory” events to cover quite a lot of territory. I think it’s too soon to guess exactly what that territory will be, or figure out the best names for its various subdivisions. Yeah, I think “categorical process theory” as I sketched it (one could simply call it “process theory” for all I know) is another name for the sub-branch more or less described by “compositionality”. I’m not sure about pregroup grammars either, but who knows. Well, first let me say that on reflection, I expressed myself far too harshly before (the “obnoxious” and “embarrassing” could be turned back upon my own post). So, I owe an apology to Tai-Danae for my initial intemperant remarks. I might say something at her blog, but I’d like to say something more publicly here. I still do feel strongly that the book needs better disclaimers, needs to circumscribe more carefully what the book is about and not about, with a more robust recognition that many aspects of what could rightfully be called Applied Category Theory will not be touched on at all. What remarks that I do see touching on this seem too perfunctory or inadequate. More recently, however, category theory has found applications in a wide range of disciplines outside of pure mathematics – even beyond the closely related fields of computer science and quantum physics. These disciplines include chemistry, neuroscience, systems biology, natural language processing, causality, network theory, dynamical systems, and database theory to name a few. And what do they all have in common? That’s precisely what applied category theory seeks to discover. In other words, the techniques, tools, and ideas of category theory are being used to identify recurring themes across these various disciplines with the purpose of making them a little more formal. This is what the phrase applied category theory (ACT) is meant to describe. Again, I think that last sentence goes too far. The problem may simply be the use of passive voice (meant by whom, exactly?). If it were rewritten in an active voice, saying instead something like, “This is what we will mean in this book when we use the phrase applied category theory”, then the whole tone changes. I do think it’s important (given the way that category theory has been received over the years) to be mindful of tone. Thus, I wouldn’t mind so much if the author keeps the title but just forthrightly admits to using the phrase ACT as a convenient shorthand for a more circumscribed subject area – the real problem being that no one has come up with a better name for what that area is exactly. Finally, to avoid a possible misunderstanding: I’m not bothered by titling a conference “Applied Category Theory 2019” or whatever. That’s not a declaration of what the subject is. Maybe we should try to reclaim Systems analysis as “categorical systems analysis”? That field was inspired by electrical system analysis and was soon applied to all sorts of things. Then again this may be an association to avoid because some regard Systems Analysis as a buzzword used to imply scientific rigor without it being present. First, I’d like to thank Tom for bringing to my attention this lively discussion! Thank you for the constructive feedback, Todd! These are simple, easy edits to make. But that’s just my perspective. It’s also the perspective I wanted to share through the booklet. I wanted to help others see that math is being applied in vibrant ways that they might not have considered before. Again, though, this is just my two cents. I hope that the mathematics within the booklet was presented in both a faithful and an inviting way! Thank you, Tai-Danae, for your very gracious response in general, and to me particularly after my intemperate (not, ahem, “intemperant”) earlier remarks. My only beef was about some perceptions of how the scope of “applied category theory” was being described in some things I’ve read. But it looks as though that point has been understood. I was led to some interesting things through your book. For example, the SEP article on compositionality. And also: even though Lambek was one of the examiners of my thesis back in the 90’s and I knew of a bunch of his papers on linguistics and monoidal biclosed categories, I didn’t know about his work on pregroup grammars. Probably this deserves mention at the nLab. John’s comment above makes me more comfortable with the general term “applied category theory”, because it sounds like everyone does intend it to be used more generally to include all applications of category theory (and in particular, also the older ones such as “Category theory in functional programming”) rather than just the particular new ones being developed recently. Thus, Todd’s suggestions are very much along the lines of what I would have said. Luckily, some people enjoy making up names for things and arguing about them. Personally, I wouldn’t say that I enjoy making up names for things and arguing about them. The reason I’m willing to spend time on it is rather because I believe that it matters what things are called. I assume that Tom and Todd share this opinion. But I also get the impression that some people don’t believe it matters what things are called, and so when we make arguments of this sort they regard it as “just playing around for fun” and don’t take it seriously. (I’m not claiming that John, or any other particular person, falls in this category, just that I’ve gotten such an impression from various conversations.) I don’t know if there’s a way to convince someone that names matter if they don’t believe it already, but maybe we can at least communicate a bit better by recognizing our differing assumptions. I don’t enjoy arguing either. I might sometimes enjoy the challenge of coming up with a pithy name for something, but it’s not something I actually spend much time doing. For me it’s not naming that’s the real issue here, but some perceptions in how people are describing the scope of names in various places, that needed to be discussed more fully. I’m glad we are keeping the discussion friendly. It is true that the name “applied category theory” may not be the most accurate. There is however one thing that I want to point out. The “applied category theory” community, however accurate or not the name might be, is doing its best to make category theory systematically concrete, avoiding as much as possible to hide in an ivory tower of abstraction. In the past, a lot of people in the category theory community seemed to enjoy the fact that the field was inaccessible to many (I admit I’m guilty of this too). This is one of the reasons why category theory is not so well-received. The “ACT” community is doing its best to reverse this attitude. They are by far not the first people to do this (John Baez and Eugenia Cheng have always done this, to name only two), however this task seem to be the very motto of the “ACT” community. For this, the name “applied category theory” is kind of appropriate: it can mean something like “concrete category theory”. It is not mathematically accurate, but is describing very well the attitude they have. The theory of adjunctions in bicategories. Adjunctions between categories, i.e., choose Cat. A particular adjunction between two named categories CC and DD. A choice where such CC and DD have objects which model something in the world. One will look to learn from other levels, but the ACT attitude seems to be to want to keep one foot on the bottom level. Perhaps Mike’s n-theory idea captures part of such a scale. In work on applied category theory I want to keep a close eye on topics in science and engineering that could benefit from more category theory. Often these topics will also involve other kinds of math — how could they not? — so I believe the “ACT attitude” should include a fondness for connecting category theory to branches of math that traditionally were considered “too applied” to benefit from categories, like differential equations, statistics, etc. I believe there are large exciting new realms here, just waiting to be developed. I’m spending most of my time on this, and discovering wonderful things, but I have the strong sensation that I’m just scratching the surface. I also think that we will need new ideas within category theory (and nn-category theory). I can’t shake the impression that the reason biology seems ‘messy’ is that living systems operate on a higher level of abstraction than physics and chemistry. I don’t think a mere ‘mess’ could do the wonderful things living systems do. But it’s hard for us to separate out the complicated details from the important patterns, because we don’t yet have an adequate language for those patterns. “Applied Category Theory” Here we won’t specifically talk about programming because it’s not my strength or we would have to go too deep into the weeds about programming or whatever. I wouldn’t stop using the term simply because you aren’t SPECIFICALLY talking about programming, I would just make sure to point out that your focus in this exercise isn’t programming but that doesn’t mean it couldn’t be. I edited my remarks on June 3, one day after Tom suggested here that they might be improved.